Commuter benefits, also known as transit benefits or transportation benefits, are an employer-provided program that helps employees reduce their monthly commuting expenses. As a pre-tax payroll deduction, transportation benefits can reduce employee income taxes and employer payroll taxes. Commuter benefits span public transit, vanpooling, bicycling, and work-related parking expenses. Commuter benefits laws make them mandatory in some cities including New York, Washington DC, and San Francisco. In this article, we will explain what commuter benefits are, whether or not you are required by law to provide them, and how to offer them to your staff. One option we recommend for setting up commuter benefits is to work with an HR / payroll provider like Gusto. They can set up transit benefits for your employees, ensure your business stays compliant, and help you get the right tax breaks. Commuter benefits started in 1993, when the IRS wanted to encourage people to use public transit. Bicycling benefits were added in 2009. Regulations vary by state, which we’ll discuss more in the next section. The places listed below have commuter benefits laws that require businesses to provide commuter benefits. With the exception of Berkeley, these laws apply to companies with 20 or more full-time employees. The commuter benefits law in Berkeley applies to companies with as few as 10 employees, even if those workers only work part time. If you don’t do business in one of these locations, you may be still be able to get a tax break by providing commuter benefits, but aren’t required by law to offer them to employees. Commuter and transit benefits are available only through an employer, so your employees cannot simply go get them on their own — unlike life insurance or health insurance. Your employee receives / uses a card to pay transportation costs. This can be a transit pass, membership card, or debit card (for transit use only, similar to a debit card they’d get with an FSA or HSA), depending on the type of transportation they use and the provider you go with to offer commuter benefits. The employee’s taxable income is lowered, since commuting costs are deducted from their income using pre-tax paycheck dollars. Your employer payroll taxes are also lowered by the total amount that all employees contribute pre-tax, because that amount is no longer categorized as taxable payroll dollars (wages or salary) for your business. Some U.S. states shown below also offer state tax incentives. Example: If the employer pays $500K in payroll, that $500K is taxed. But if total payroll is reduced to $470K because of employee commuter benefits being deducted pre-tax, then the employer only pays payroll tax on $470K, not $500K. If the employer contributes money to offset the employees’ transportation costs, that money is also tax deductible from their business income tax. Employees cannot get the tax savings on their own unless you, their employer, provide these kinds of transit benefits. Therefore, we encourage you to consider offering commuter benefits. It’s a win-win situation — you save on payroll taxes and your employees save on income taxes. Next we’ll cover how to offer commuter benefits for your employees. There are three different ways to offer commuter benefits to your employees. TransitChek (provided by WageWorks) – Provides debit cards, parking cards, metro cards and vouchers that employers can purchase for their employees using employees’ pre-tax dollars. Products are delivered directly to employees’ homes, and employee enrollment is done online. Additional options are available for employees in New York. Alice – Lets employees use their own debit or credit card to pay for parking, transit passes, or bike repairs, and then integrates with your payroll software for employee pre-tax deductions. It uses a mobile app to communicate with employees for enrollment and to verify whenever their preferred card appears to be used for an eligible expense. Alice also generates IRS forms for you to sign and store with a digital signature to streamline year end tax reporting. Using a third-party provider like TransitChek or Alice will help you administer commuter benefits, by making sure the right employees have the right passes. If you are in one of the cities that requires commuter benefits to be offered, there may also be a local government agency that facilitates employers providing transit benefits. We advise you check your city’s website. For example, search the internet for “city name” + “commuter benefits”. If you use HR benefits or payroll software, like Gusto, that has the option to provide commuter benefits, then you can set up employee deductions and your employer contribution directly within the software. The program will handle the rest. Or if you’ve been considering a Professional Employer Organization (PEO) like Justworks, now might be the time to add commuter benefits to your package. However, Justworks provides commuter benefits through WageWorks, so if you or your employees have questions, they’ll be redirected to WageWorks. In fact, we recommend using HR software or a PEO to make sure that you correctly link employee benefits to payroll deductions, and remain compliant with transportation benefit laws and limits as they change. They’ll also ensure you’re able to take advantage of any and all state and federal tax breaks. You could offer the commuter benefit yourself by setting up a company account with the local transit agency and registering for passes under the company name for participating employees. Or, you could simply buy the passes yourself and sell them at your workplace. Providing transit benefits providing yourself makes the tax deductions a bit more complicated because you need to track who bought what, when, and for how much. You’d then need to make the appropriate deductions in your payroll system manually. The actual cost of offering pre-tax transit benefits is up to you as the business owner, depending on how much you want to contribute (if anything) on behalf of your employees. If the employee pays 100% of their commuting costs using pre-tax dollars, it costs you nothing. The nice thing is that even if you contribute nothing, you and your employees still get the tax savings. As a business, you can offer up to the limits shown above, or you could pay a set amount per employee each month, such as $25 or $50 per month, to help them cover work-related transportation costs. Your contribution is offset by federal business tax deductions for these same amounts, so why not help out with a contribution that employees will appreciate? According to WageWorks, employees can save between 30-40% on their commuting costs or about $400-$500 per year by using commuter benefits. WageWorks even provides a free calculator to let your employees determine in advance how much they may be able to save if they sign up for commuter benefits. As mentioned above, even if you contribute nothing to your employees’ commuting costs, you will benefit from a payroll tax deduction by making commuter benefits available to your employees. And your employees will save on their federal income taxes. It’s a win / win. If you choose to cover a portion or all of your employees’ commuting costs, then you get the payroll tax break plus a federal income tax deduction on the amount your contributed. Some states provide additional savings on state income taxes for employers who subsidize some or all of their employees’ commuting costs. 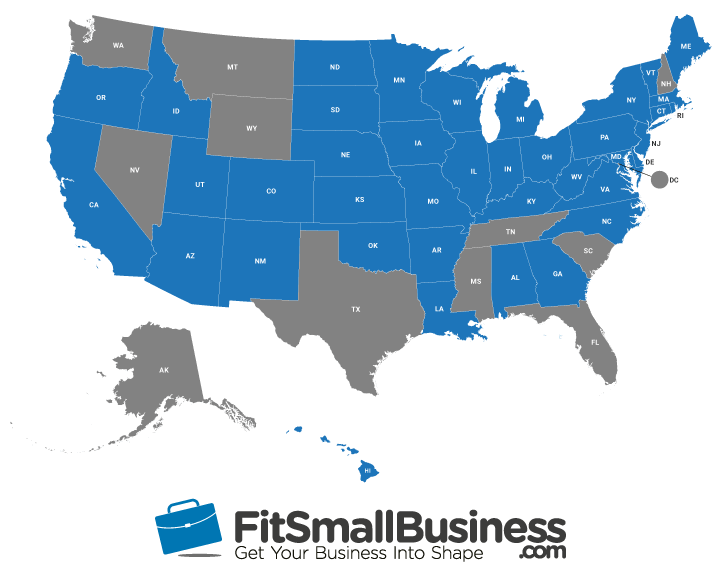 If your business is in one of the states shown in blue, in addition to federal income taxes, you and your employees may save on state income taxes or get additional tax breaks. For example, in Maryland, employers can get a 50% tax break on their contributions toward their employees’ commuter benefits. If your business in is one of grey states shown below, there are no additional state income tax breaks for you or your employees. Review our state tax article to go directly to your state tax agency for more information on state tax deductions. To ensure you get the tax savings you deserve, consider using tax preparation software or a bookkeeping service. If you employ 10-20 or more employees in one of the locations that requires transportation benefits, then it’s not really an option — you have to offer commuter benefits to your employees. Even if you’re not in one of those locations, transit benefits can be a great, low cost option for you to help employees save money on transportation costs, while lowering your payroll taxes. You may even find that providing commuter benefits helps you recruit new hires who appreciate your willingness to help them offset their transportation costs. We recommend working with a benefits provider like Gusto to offer transportation benefits to your employees, stay compliant, and get the most tax savings for your business. The state of New Jersey added themselves to the list of those requiring commuter benefits, according to Namely. https://blog.namely.com/new-jersey-becomes-first-state-to-require-transit-benefits/ The law goes into effect 3/1/2019, but businesses won’t be subject to enforcement until 3/1/2020. Thank you for such a wonderful article Laura! Spot on! It’s totally a win-win situation both for the employee and the employer. This will definitely help you attract talented new hires as they’re eyeing for commuter benefits! Thank you for commenting. Fit Small Business in fact offers commuter benefits to our urban staff, so we agree it’s a win-win!